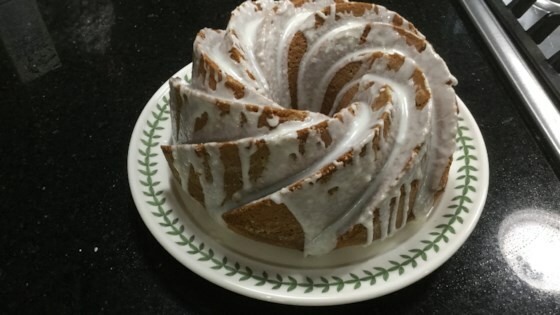 "This cake is very easy to make and tastes wonderful. You can use different pudding and cake mix combinations." In a large bowl, stir together cake mix, pudding mix and poppy seeds. Make a well in the center and pour in water, oil, and eggs. Beat on low speed until blended. Scrape bowl, and beat 4 minutes on medium speed. Pour batter into prepared pan. Bake in the preheated oven for 50 minutes, or until a toothpick inserted into the center of the cake comes out clean. Let cool in pan for 10 minutes, then turn out onto a wire rack and cool completely. DELICIOUS!!! I used Duncan Hines' "Butter Golden" cake mix instead of "Classic Yellow", and it was really great. It's a bit decadent, but it's really great!